Perfect white return air grilles will lay almost flat against your wall to cover up gaping duct openings. These all metal air vents are crafted out of steel and are available in over 55 sizes. Our return air grilles are screw mounted either to your wall or ceiling with the screws which are provided. Sturdy metal air vents are finished with a bright white coloring and will look great in any space. The listed return air grille size is based off the hole opening in your wall or ceiling, so order accordingly. 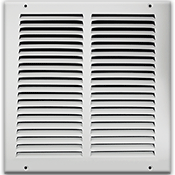 The metal air vents have a 5/16" of depth to their sides and let air continuously flow through your home. Depth to side is 5/16"
Tip:To order the correct return air grille, you must remove any existing grilles from your wall. Measure the hole opening to order. A 10" x 6" metal air vent will cover a hole opening measuring approximately 10" x 6" inches. The metal air vents are listed according to the hole opening in your wall. Add approximately 1 3/4" to the size listed for the overall faceplate dimensions. Please note: The photo above will change according to the grill you select from the drop-down menu below. ***The price for the 36" x 14" and 36" x 18" incorporates the cost for the special box that is needed to protect the grilles during shipping, which is needed due to the larger size of the grille. Searching for a return air grille to hold either a filter or which has a 7/8" depth to the side? Check out our Return Air Filter Grilles or our Baseboard Returns for other helpful products. Purchase your metal air vents now to have this item shipped straight to your door at an affordable price.